Where do you find Asbestos Cement? 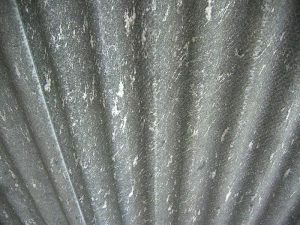 These are mainly made up of large sheets of corrugated asbestos cement; they are often found on industrial or farmyard buildings, but also can be found as roofs on garages and sheds. They are usually covered in mosses as they’ve been there for many years. Shape and structure similar to roof sheeting, and is often found on walls/as walls of buildings with asbestos cement roofs. Sometimes attached at the end of cement roofs in warehouse type buildings. This may be found in boiler systems (including domestic) air conditioning and ventilation systems. Examples include water tanks, fire surrounds and pipes. What does Asbestos Cement look like? Asbestos cement is just ordinary cement mixed with asbestos, in some cases asbestos can make up over a third of the cement. It is a hard, grey material which was moulded and compressed to produce some of the materials listed above. How dangerous is Asbestos Cement? As the asbestos is held tightly within the structure of the cement not much is given off when this is broken, however more asbestos fibres will be given off if it is broken, sawn or drilled. Unless you know exactly what you are doing, have the full protective equipment and follow every heath and safety procedure you are putting yourself and others at risk. Work with any type of asbestos is dangerous which is why the HSE have produced a number of guidance sheets. IF YOU HAVE ANY DOUBT REGARDING ASBESTOS CEMENT PRODUCTS AND HANDLING IT, CALL US FOR A FREE SURVEY. WARNING: Asbestos cement can sometimes be found with other more dangerous asbestos materials such as sprayed coatings – make sure you check before you carry out any work. Asbestos cement is also very fragile and deaths and injuries from falls through asbestos roofs are common – do not stand on it! Where do you find Asbestos Floor Tiles, Textiles and Composites? Sometimes you may find asbestos floor tiles hidden under carpets.Textiles can be found in fuse boxes behind the actual fuse. Old fire blankets and heat resistant gloves can also be made out of asbestos textiles. Asbestos composites can be toilet cisterns and seats, window sills, and bath panels. Asbestos paper was used for lining under tiles and inside metal cladding. What do Asbestos Floor Tiles, Textiles and Composites look like? These asbestos containing materials are not very distinctive from what is used now. To make sure we recommend you ask the owners about how long they’ve had certain things or look for a trade name. If you find a trade name you can contact us and we can advise you or arrange for a qualified asbestos surveyor to inspect it free of charge. IF YOU HAVE ANY DOUBT REGARDING ASBESTOS TEXTURED PRODUCTS AND HANDLING IT, CALL US FOR A FREE SURVEY. How dangerous are Asbestos Textured Coatings? These should be treated with caution, if in doubt assume they are asbestos and treat as such. If you suspect that you have an asbestos textured coating, contact us and we will advise you of the best course of action or even survey it for you free of charge. Where do you find Asbestos Textured Coatings? This is dependent on the particular decorative finish required i.e. peaks or patterns. They are hard and were originally white in colour but have often been painted over. The asbestos fibres are held in place within the structure and are not easily given off and breathed in, however they are easily released if the coatings are sanded down – never do this. Where do you find Loose Fill Asbestos? Asbestos loose fill was used to insulate industrial and domestic premises so can be found in between cavity walls, under floorboards and in loft spaces. What does Loose Fill Asbestos look like? This is a loose, fluffy insulation material (similar to candyfloss), which may be blue-grey or whitish in colour. The best advice if you suspect that it even could be asbestos lagging is to contact us and arrange a free survey to either confirm it or eliminate it. We will be able to advise you exactly what your options are, and if it is confirmed as asbestos loose fill material, we can remove the contamination quickly, safely and efficiently at an affordable cost. How dangerous is Asbestos Loose Fill ? Probably the most dangerous asbestos containing material. Loose fill is made up of pure asbestos and if disturbed can release large amounts of fibres in to the air, where they can be breathed in.